11 1/2-inch action figure boasts an amazing likeness of the Hollywood icon. Inspired by her role in the classic film Gentlemen Prefer Blondes. Features 30 points of articulation, 5 interchangeable hands, and an authentic fabric costume! Accessories include "diamond" earrings, bracelets, and necklace, and a fabric fan. 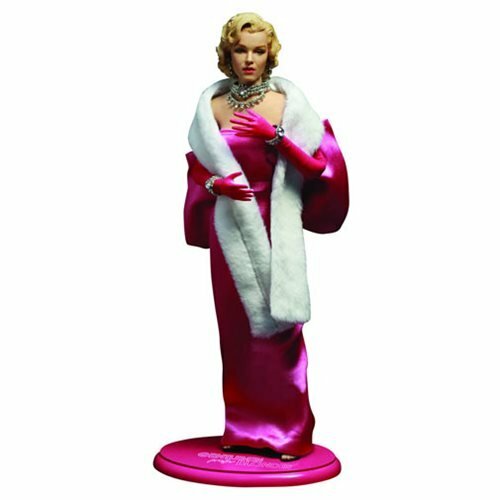 Marilyn Monroe stole the scene in the classic film Gentlemen Prefer Blondes when she sang "Diamonds are a Girl's Best Friend," and you can recapture that moment with this marvelous Marilyn Monroe Pink Dress 1:6 Scale Action Figure. The beautiful figure stands approximately 11 1/2-inches tall and boasts a fully realized likeness of the Hollywood icon, 30 points of articulation, 5 interchangeable hands, and an authentic fabric costume. Showcase Norma Jeane with the included display stand, and bring her to life with bonus accessories like "diamond" earrings, bracelets, and necklace, and a foldable fabric fan. Recreate your most memorable scenes with the Marilyn Monroe Pink Dress 1:6 Scale Action Figure! Ages 15 and up.